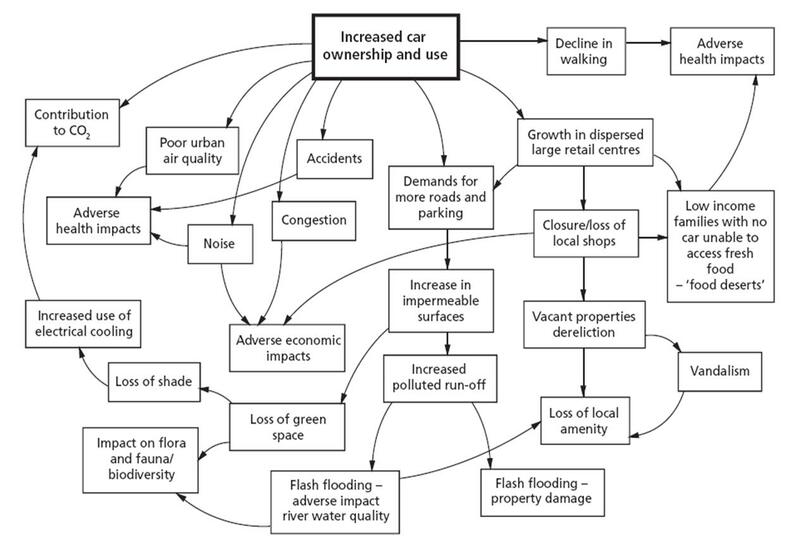 The problem with cars in the city: "Possession combined with brute force make up ten-tenths of the law"
Bruce McVean, founder of the Movement for a Liveable London, describes how fundamental the problem is with cars in the city. He notes that he problems go far beyond the fuel that is used to power them. The possession of road space by cars, and the actual and perceived danger that comes with it, means that many people are discouraged from walking unless absolutely necessary and would never contemplate cycling. Statistically walking and cycling may be low risk activities – and the health benefits certainly far out way the risks – but no amount of statistics can change the often unpleasant and at times frightening experience of trying to negotiate a street network that has been engineered around the needs of the motorist. McVean concludes that cars are needed for about a third of the trips that are taken now, and that it would be smarter to use sharing services that give you the vehicle you need when you need it: a van for moving stuff, a people carrier for birthday parties and "a convertible sports car for that romantic weekend in the country." He predicts that "If the private car’s time is up, the age of the bicycle is just beginning." The big villain isn’t the internal combustion engine, it’s the car.